Automobiles may offer freedom and the ability to get from point A to point B without much work and in the shortest amount of time possible. But they also can be destructive forces when put in inexperienced or impaired hands, or in conditions unsuitable for safe driving. Sadly also, it is a fact that even though you may be the best driver, chances are that other drivers or road users may not be as careful as you are, and could often be the cause of an accident. By breaking traffic laws that other vehicles and pedestrians adhere to, you are compromising not only your own safety but the well-being of innocent civilians, too. Alcohol and other intoxicants lower a driver’s reaction time and judgment. While most states usually allow drivers to have minor levels of alcohol in their bloodstream, anything above the legal limit compromises your ability to successfully operate a motor vehicle, increasing the potential risk of an automobile accident. No matter how many Red Bulls or cups of coffee you consume, depriving your body of needed sleep or rest will surely lower your reaction time and and your ability to function at optimal levels, thereby greatly increasing the likelihood of a car accident, should you operate a motor vehicle in such a state. Weather conditions such as sustained and heavy wind, heavy snowfall, rain or ice can drastically increase the likelihood of an automobile accident, even when you are extremely careful. Adverse weather conditions usually affects the condition of the roads, ranging from poor visibility, debris on the road, and more, all of which increase the possibility of a road traffic accident. Moreover, bad weather conditions can often cause damage to road infrastructure, such as a pothole, which can in turn cause accidents. Even though manufacturers usually recall defective vehicles, more often than not, this does not happen until enough injurious or fatal accidents have occurred. Defective vehicles can also be the fault of a mechanic who failed to notice an issue with a car, or an owner who procrastinated addressing an issue with the car. Therefore, it is safe to say that car manufacturers are not the only ones to blame for the breakdown of cars. Owners can be just as responsible for causing cars accidents by driving vehicles that are not road worthy. Irregular maintenance checks, thinning of tire threads, over and under tire inflation, broken taillights and busted headlights are just some of the could things that a car owner is responsible for the but which he or she may fail to look into, any of which could cause an accident. This is one of the major causes of auto accidents among teenagers and even adults. But what is distracted driving? Distracted driving is any activity that diverts the attention of the driver away from driving. This can include texting while driving, putting makeups, making phone calls, eating and drinking, and much more. There are lots of countries and states today that forbid texting while driving and taking calls using handheld devices, and the state of New York is no different. This is perhaps the most common causating factor that leads to car accidents. 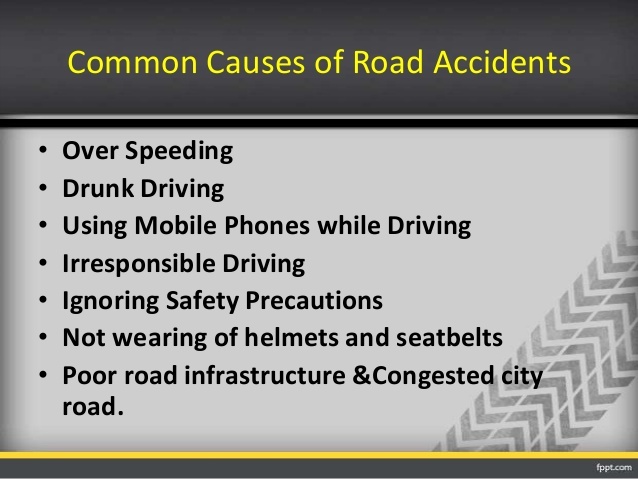 Some of the factors that contribute to driver error are numerous but include drowsiness, distracted driving, road rage, inattention, driving under the influence of medicines,,alcohol and drugs (DUI.) While such incidents are by definition considered “accidents,” and consequently unintentional, more often than not, the the guilty party will not be absolved of negligence, where such is established. Consequently, in cases such as driving while intoxicated which then results in a fatal car accident, you can expect that the individual may be criminally prosecuted, while at the same time face a civil or personal injury lawsuit from the party that may be injured in the accident. With all the advancements in technology, this factor very possibly plays very little role in causing accidents, but it nonetheless plays a role and should be mentioned. Poor road designs can include things like improperly designed lane merging, dangerous intersections, blind curves and spots, poorly designed road medians, pot holes, unsafe shoulders, damaged or missing road signs and many more, are some of the examples that constitute poor road design.In such cases, where a poor road design was the sole cause of a car accident, more so one which cause a personal injury, then it is safe to assume that the government entity responsible for managing that particular road may be held liable, it is determined that any of the aforementioned factors caused the accident, as opposed to human or mechanical error. In such cases, a good car accident attorney should be able to file and successfully bring a lawsuit against the responsible government for any personal injury and damages that was sustained by the individual.